Yesterday morning, I was wrestling my son when, as I was about to call it a wrap, he kneed me in a flash that remains a blur and my left finger burned tortuously. I know the neighbors heard me scream. At the risk of downplaying or demystifying the initiation into motherhood called birthing, I have to say it hurt more than it did bringing Tennyson into the world drug-free. I didn’t scream like that then. When I was able to open my eyes and uncurl from the fetal position yesterday, I saw blood had pooled instantly at the base of the nail. I won’t belabor the pain, the swelling, what the lack of circulation did to the hand but after a day at the doctor’s and X-Ray at Urgent Care, I learned the finger’s not broken. Just a very bad sprain that will take up to six weeks. Those who’ve been following me a while should not be surprised that I’d like to take the occasion to contemplate a philosophy of mishaps. Two voices have been trying to talk over one another in my head. Yesterday, I was everything from frustrated to worried and angry. Mostly frustrated. What is it about me that attracts accidents and physical impediments? Sheer, simple clumsiness? If you missed the Car Accident – in the Garage tale, here it is. Some hopes and plans for the upcoming months are now delayed. So disappointing that I must wait until I’m whole again. But the steady murmur that usually accompanies me won out today: on what gumption do I wake every morning expecting the day to unfurl my way like a red carpet? I often carry the awareness that everything can change any moment. A drunk behind the wheel can wipe out my family or some freak circumstance leave my son fatherless in less time than it takes to order take-out. I am not in control. So even through rough days, I live in the preciousness of the moment and gratitude for everything I have, all gifts. I want to grumble. It’ll serve me well to lay off the typing for a bit – another displeasure, as I can’t not write for long. My piano finger! In keeping with the broad definition of ambidexterity, I favor my left for a lot of tasks. The most unpalatable part has been having to slow down the mad speed that I rush toward one thing to the next with. The dishes, the showering, the doing everything with 1.25 hands. But this too, shall pass. I’ll take it – over something permanent or chemo. 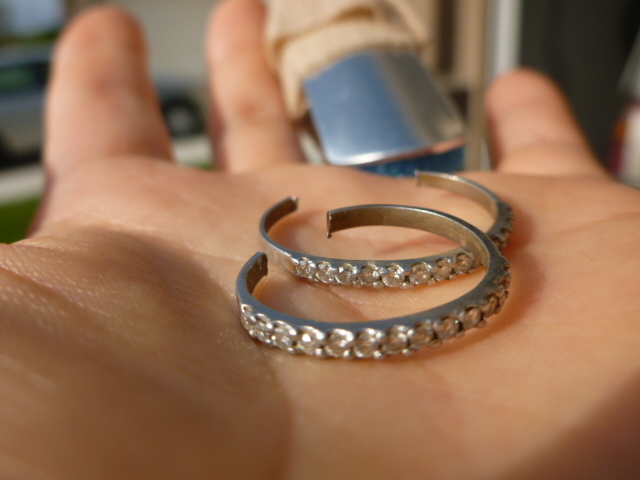 There really wasn’t a choice: I had to cut loose the pair of wedding rings. 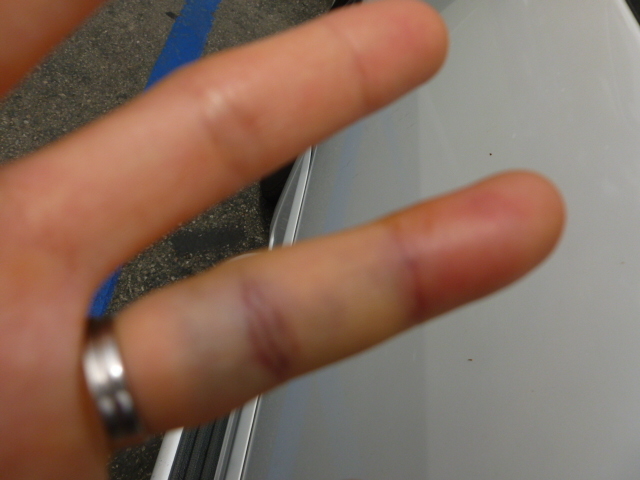 They had choked off the blood supply and were bottlenecking the finger that only kept ballooning. Peter had realized something had to be done about the rings or the finger – he was supportive, though bummed. I was SAD when they were cut apart in Urgent Care! 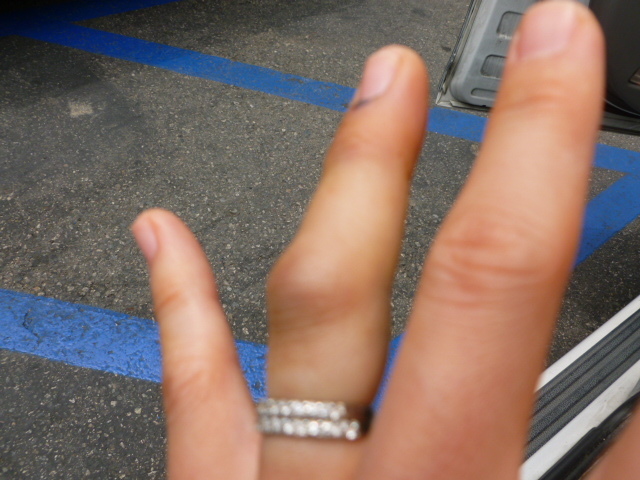 Nine years since the engagement, and my finger’s naked again. Honey, when I’m healed, I’ll need a new ring. This entry was posted in Family and tagged Accident, Christian, Finger, God, Injury, Life Lessons, Love, Marriage, Mishap, Providence, Sprain, Wedding Ring. Bookmark the permalink. I’m so sorry about your finger. Did your doctor mention having a chiropractor look at it? I was the recipient of an unplanned finger jamming (mishap at youth group) and the local chiropractor used ultrasound to nearly instantly diminish the swelling and bruising. I had 3 treatments and have FULL use of the very injured fingers. Thank you for inviting me to join your blog. I’m really enjoying reading what you write! The dr I saw is a remarkable one-man show, part chiro. His speculation that it was broken was one of the rare times he was wrong. But the ultra is news to me – most interesting, and I will look into it! His acupuncture yesterday helped the rest of me. I didn’t spell this out in the post but it was in both obvious and profound wisdom Apostle Paul spoke of the whole body’s being affected by one part; my whole arm was whacked out and I know I was affected way beyond the finger. I’ll be getting acu from a skillful, knowledgeable herbalist and L.Ac. tomorrow. I’m honored my fellow bookworm has been enjoying my writing. Look forward to talking more. Thanks for sharing, Greta! Got it! Thank you for the support. I appreciate your time. I beg your patience. About to present my other blog to my readers. Very busy. Will be in touch.